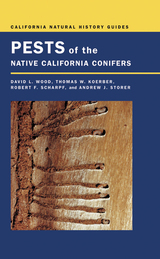 This guide synthesizes the most current information available on the pests and environmental conditions that can damage California’s conifers, the vast majority of native trees in the state. Authoritative and easy-to-use, it is an essential reference for biologists, arborists, ecologists, foresters and everyone who needs up-to-date information on conifer pests in one convenient manual. David L. Wood is Professor of the Graduate School and Professor Emeritus of Entomology at the University of California, Berkeley. Thomas W. Koerber is retired research entomologist at the Pacific Southwest Forest and Range Experiment Station, USDA Forest Service, and currently Consulting Entomologist, Entomological Services Co., Berkeley, California. Robert F. Scharpf is Retired Research Plant Pathologist, Pacific Southwest Forest and Range Experiment Station, USDA Forest Service. Andrew J. Storer is Assistant Professor of Forest Insect Ecology in the School of Forest Resources and Environmental Science at Michigan Technological University.